In the last week you may have noticed classic cars rolling through the East End or parked with their hoods propped up and on display. 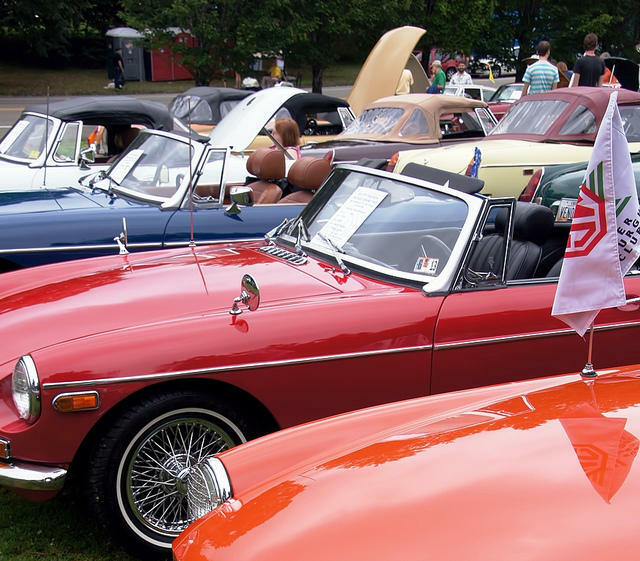 This Saturday some of those vintage cars will race a 2.3 mile street course through Schenley Park’s many twists and turns, at speeds of more than 100mph in the Pittsburgh Vintage Grand Prix. Board member and racer Mike Zappa says he’s prepped his 1962 MGB roadster by checking safety wires, bolts, tires and anyplace fluids could leak. Overall, for the vintage race car owner, Zappa says it takes two things to really prepare a 50 year old roadster to race, a lot of patience and a lot of time. Mike Zappa and his son Chris race cars all over the country and must sometimes search for rare parts to keep up with repairs. With such old and sometimes priceless vintage vehicles racing through Schenley Park through potential rain, Zappa jokes that owners can only rely on pocket insurance, “In other words, you stick your hand in a pocket and whatever money you can pull out is how you take care of the problems you may have had.” He says the only time these vintage cars can be insured is when they’re on the trailer or in the paddock, the preparation area by the starting line, and even that can be very expensive.